Oil Capitol Sheet Metal, Inc. is a member of S.P.I.D.A. The Spiral Duct Manufacturing Association. All of our Spiral Pipe & Fittings are fabricated to the latest SMACNA standards for 4" W.G. Our high-production equipment and experienced work force can provide a wide range of Round Pipe & Fittings at a substantial savings. Spiral Pipe can be Round or Oval in shape. Industrial round duct & fittings can be fabricated up through 1/4" plate in steel, stainless steel, or aluminum. 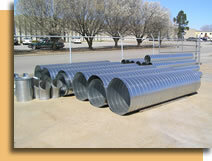 Spiral Pipe can be fabricated in Galvanized, Galvaneal, Aluminum, or Stainless Steel. Spiracoustic board and Dual-Wall is also available by special order. Spiral Pipe can be furnished as Crimped, Raw, Angle Rings, Flanged, or Spiralmate.